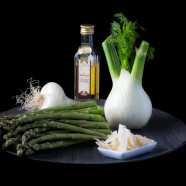 Green asparagus and fennel salad, wonderfully scented with white truffle oil – an elegant starter heralding the arrival of spring. 1 bunch green asparagus Wash the asparagus thoroughly and drain. Cut off the ends. With a pointed knife, cut into thin strips lengthwise. Then cut the strips into short pieces. 1 bulb fennel Wash the fennel, remove the hard parts and cut into thin strips. 4 spring onions Wash the spring onions and slice thinly. 3 tablespoons white balsamico Add the olive oil and white balsamico. Freshly ground mixed pepper Season with salt and freshly ground mixed pepper. Let stand in the fridge for 1 hr. 80 gr parmesan cheese With a sharp knife, shave the parmesan. Mix into the salad. White truffle oil Just before serving, add a few drops of white truffle oil.